I finally got the bathroom totally gutted, including pulling up the particle board (OK, this stuff had been wet, so pretty much just vacuumed up), and the plywood subfloor. So what we see now is the very bottom base layer of floor, which is 2x8 planking over 4x6 beams, 48" OC. Well, that's what it once was. 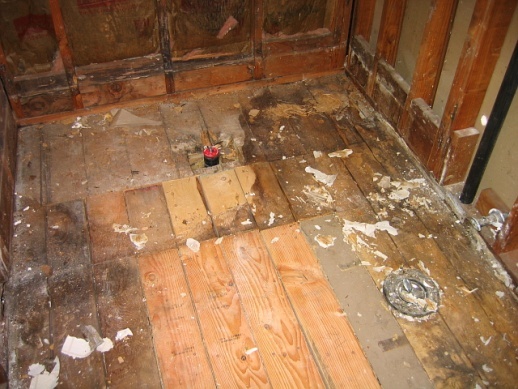 In these pictures, you see the franken-floor that has been built over the years. Most of it is pretty solidly braced underneath (I crawled into the crawl space today to see what was under there), but some of those shorter boards in the picture, I kid you not, are only connected on one end and are completely loose on the other end! So I can't step on those ones, obviously. Anyway, in the close-ups, you can see that the planking under the wall on both sides of the bathroom (which is where the front corners of the shower pan were) is not there at all, and the base plate of the walls there is rotted through as well. I think I'd rather have this done the right way, so I guess it's time to call in someone who knows for sure what to do here, unless one of you has a fantastic idea! I didn't see the spots in the crawl space where these planks must be missing - it's mostly covered by insulation down there of course. What do you guys think? The floor looks like it's been worked on over the years due to the different collors in the planking. Did you remove the roted wood before you took the picture? That's drywall on the far side of the footer so I would haveto assume that it's an inside wall. If it is an inside wall how did the moisture get to the footer to rot it out? If there's been an addition added on or something to stop future rot you may not be in that bad of shape. There's wood missing put overall the board looks to holding the wall fine, although you might want to shoot some expanding foam or something tokeep the moisture from the crawl space from getting inside the wall. I moved to Florida from Illinois. I worked 3 summers in high school for Ma Bell (note that after the broke the Bell System up everything is owned by the Baby Bell's and GTE that changed it's name to Verizon it's gone back to everything being owned by Ma Bell and GTE again) because my dad ended up being the VP over engineering. The first to summers he was what is called the “Wire Chief” over all of Northern Illinois. Nobody wants to work with the boss's kid, but your boss's,boss's.....kid is something else. The let me leave 2 weeks early for the sheer fun of double sessions footbal practice, and that when I let them know who my dad was. All I replied to all of the you didn't tell him's, was that he'd have killed me first. It's been a long time since I've even seen a crawl space and I don't miss them a bit. Who ever came u with the name crawl space? It should be,”lay on your back and shimy space”. For you to get rot where the shower was just means that you had a leaky shower. The missing base boards by the shower may never have been there to allow for the plumbing. The big question would be “how solid is the floor as a whole? 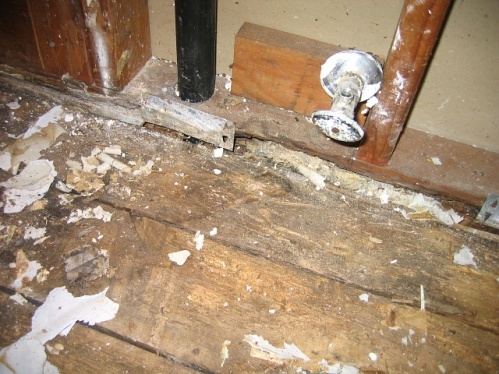 If the floor is still good and solid and after replacing any rotten boards in the floor, you could raise the drain for the shower and toilet and them overlay the entire floor with new plywood. I wouldn't trust thoseshort boards though. I wold pull those up and run 2 x 6's or 2x8's all the way to the backwall and throw a cross strut in if you still have one end unsupported. They also cut out way to much board out around the red capped pipe thatI assume is the shower drain. As long as the floor is solid your going to end up with a good solid floor. There will be a slight rise going into the batrhroom. I always make my own floor james at doorways myself out of oak with counter sunk screws a wood dowels to give it a nice finished look. If you slope the board there won't be a “trip over rise”. If there is carpeting outside the bathroom router that edge round so the carpet can be tucked under it. Then router the bottomsideof the board to allow for the rise. If you're going to pit tile down, remember to allow for that. But you make the jam last anyway. That would be a lot cheaper than bringing in a pro. But if the floors not good and solid you'd have to tear up the whole floor and run your joists 24” OC. That would require brining in a pro or several friends to thelp you out. whole floor and run your joists 24” OC. Just remove all the planks and the old insulation. Now slide in new 2X8 or 2X10 joists on 12" centers. This size depends on the span between bearing points below. (a beam or post or foundation ledge) If you can not do this step at least you saved on the demo and cleanup work. Then replace the plumbing if necessary. Then replace the insulation with the paper facing towards the room (warm side) Then glue and screw new 3/4" T & G plywood. And another layer of 5/8" exterior plywood if you want to tile this floor. Post any questions as you go and you can easily do this work yourself. Adding joists underneath is not the easiest prospect - there is nothing to string them on , frankly. The 2x dimensional lumber is a very solid floor that I don't really intend to replace. If you've never seen a house with this type of floor up on beams spaced 4 feet apart, it's actually very solidly built. It's just that the areas where there is new 2x lumber there, the planks need to be supported on both ends! I think that the super short ones and the medium ones next to them need to just be replaced with long ones that span the whole distance - that would be 48" boards, and they would be supported on a beam on both sides at that point. Then once that's reasonably level, it needs a layer of 1/2 inch plywood over the whole thing (no particle board, which was a major mistake of whoever did this previously), and then the shower pan on top of that on one end, and some durock or something on the rest to tile over, and that will be that. It's just the base plate on the sides that I can't really repair, because there's nothing to attach a small piece of 2x4 to replace that base plate - the plank underneath is missing. A subfloor needs to be 1 1/8" minimum for a tile installation. The 1/2" cement backerboard does not take play in this dimension. 1/2" plywood is simply too small and will have too much deflection. With 1/2" plywood, this subfloor will have a total thickness of 2 inches. Post and beam floors like yours are very strong. The problem comes as you replace the 1-1/2" thick T&G decking because in some places it runs under the walls. It also has to be slid into the T&G part, for it's strength. 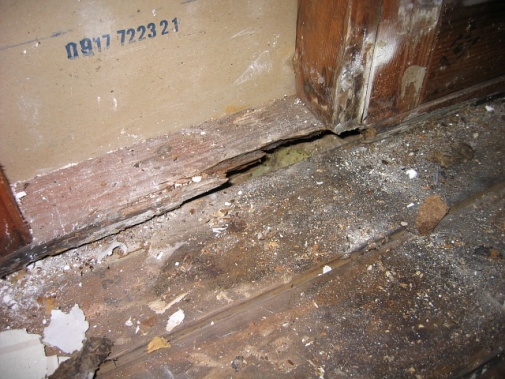 It all hinges on how much, and how deep the dry-rot is, from the water damage. The last board installed, cut the bottom groove only off, to slid and drop in place. If the bearing 4x6's work out as to not under a wall, do the work yourself. If in a pinch, you could joist with 2x4's (span 4') on hangers on 2x6's, header and footer joists between beams (44-1/2"). You may lose your 24" to earth required to the floor boards there. To fix the plumbing wall void underneath, nail wood boards under and perpendicular to floor boards from the crawl, then foam the 1-1/2" deep voids from above to air seal. If any ads are present below my answer or words underlined/colored, I do not condone/support/use the product or services listed/linked to, they are there without my consent. 17,000 dryer fires a year, when did you last clean the inside of the dryer near motor or the exhaust ducting?